I have a new 2-bedroom version of my spiral house design. This version includes a large grow bed, exposed timber ceiling and living roof. Ample light is provided by the window wall next to the grow bed, window and door glazing, and suntubes. Distinguishing features include two bedrooms, masonry two-way fireplace, covered porch and cool pantry for storage of food (no electricity required for refrigeration). An alternate roof plan is available for building with TJIs where wood poles are not available. There’s even a door planned in for future expansion. This home meets zero energy standards, and is now one of my favorite. 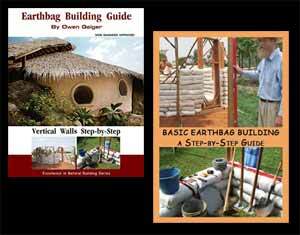 More information is on my Earthbag House Plans site. Very nice design, I like it alot. Do you think it is possible to build 3 or 4 bedroom house? Yes, you can build any size house you want if it’s designed and built correctly. Long straight walls need additional support from posts, buttresses, rebar, interior walls, etc. Always build a small structure to learn the basics before tackling something large.